Looks like a great pillow! That is just too darn sweet!!!!!!!!! Now that is a true picture of mother and child bonding! You gotta love that stuff for the ahhhhhfactor! This looks like me and my two kids on the sofa after a long day. The babies sure growing fast. Your world is just one huge bundle of adorable fuzzies these days! Mine, OTOH, is a warm laptop, a tight writing deadline, and new contact lenses that are giving me a headache. Wanna swap? That's the sweetest thing I've ever seen. Awwww... that certainly does look like a comfy pillow! 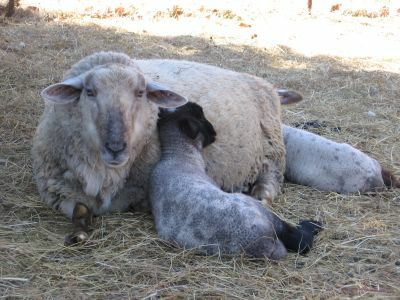 Sometimes I feel sorry for the ewes because they can't hold and snuggle their babies, but they do manage to get close like this--and it's so darn cute. Yikes, that's a lot of money for hay. Ouch. I swear they grow by the hour. LOL, I love your twin insight. Keep it coming! I suppose I should have made you two little woolly beds like I made the dogs and outside cats. I can't believe I didn't think to do that. I come up with a lot of excuses to go "check on the sheep" this time of year, just so I can adore the lambs. It really is amazing how fast they grow. And they do stay adorable, but the tiny newborns always win my heart--and make the "old" lambs (two or three weeks old) look so big and grown up.